I am going to preface this post by saying that anger is a horrible emotion, it eats away at you and consumes your life, for the next 12 weeks I became a very angry person, not to Alethea or Ryan, I just had anger in me as to what had happened with Liam, and I wanted justice for his death, it was untimely and to me it should not have happened, but I will ask you to hold comments on the actions of the hospital and staff until you have heard the WHOLE story (yes I do know that there were a lot of things that happened that shouldn’t have happened, and I appreciate that a lot of you have contacted me voicing your opinion) . MY story for the next 12 weeks is very biased but these are the emotions that I went through and these are the thought processes that I had. Monday July 23rd Ryan returned to work, and I had my first day with just Alethea and myself. My little munchkin and I have most of our days planned out, I had tried to keep her as busy as possible before Liam came along doing lots of fun and different activities, because I had figured that after Liam had come we would be spending a lot more time at home and I wanted her to have as much fun as possible with me before the new baby came. 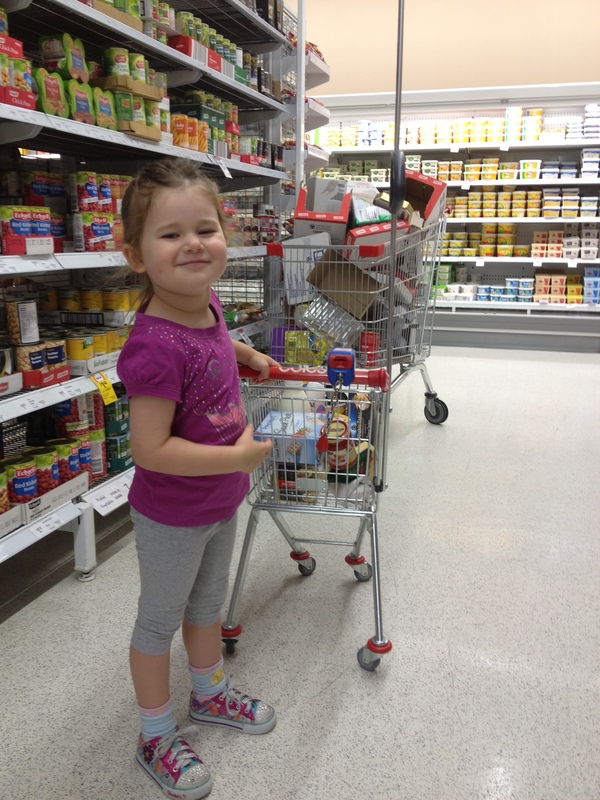 Monday is however always our shopping day, Alethea LOVES grocery shopping, she gets her own shopping trolley at Coles and knows where most of the regular items that we buy are in the shop, so she merrily goes about getting what we need chatting with her little high pitched voice. This day I had asked her to go and get me half a bag of mushrooms which she was happily doing and a shop assistant (who had seen and talked to me every week while I was pregnant, but had obviously forgotten that I’d been pregnant) said ‘Isn’t she a good helper, is she your only one? I have a daughter a bit younger than yours and I am 13weeks pregnant and expecting my next one’ It was the first time that question had been asked of me and I really didn’t know what to say, if I said yes then I felt that I was not honouring Liam, if I said no then I felt I had to explain, so I explained that no she wasn’t my only one, that I had a baby 4 weeks previous, but sadly he had died 3 hours after birth. ‘Oh, I’m so sorry’ she said with her head down, and then walked off with her trolley telling me she had to get some more potatoes, and I realised after that encounter that from then on when people asked me how many children I had, I would always say 2, but I didn’t have to explain where my other child was. We coped surprisingly well that day, we kept ourselves busy so the day went by quickly. Unfortunately as Alethea had seen Ryan and I very upset over the previous few weeks, she needed constant reassurance, she kept asking me (and still 3 months later she asks) ‘Are you happy mummy’ and I would tell her that yes I was happy, but I was sad that baby Liam wasn’t here with us, but for her at this stage she couldn’t accept this answer and she would keep asking it until I said ‘yes I am happy’ and once I said that she felt safe, she felt content and she could continue with whatever she was doing. The next day (Tuesday) Alethea and I got ready in the morning and headed to play group. Generally speaking the play group that we go to is fairly large, so although I know nearly everyone by sight, there are still a lot of people’s names that I can’t remember, but everyone there knew that we had lost our baby and even people that I didn’t know came up to me to tell me how sorry they were for our loss, and it was nice that these people made the effort to talk to the lady with the dead baby rather than treat me like the lady with the dead baby and ignore me. Lots of the ladies asked if I had any pictures of Liam and would I mind showing them, and of course you don’t have to ask me twice as even though Liam was not alive, I was the proudest mummy that there could be, he was beautiful and I proudly show photos to anyone who wants to see him. Alethea had a great time at playgroup, all the ladies treated her extra specially, giving her balloons and letting her do whatever craft she wanted to try. We came home and had some lunch and then it was time to go to Alethea’s swimming lessons, and she had a great time, she’s that one child that is in the pool that likes to include everyone else in the fun that she is having, so she constantly waves to me and blows me kisses as a way of including me in her fun, and I think it is beautiful, of course she concentrates, but when she waits for her next turn she likes to include me. She is also that extra excited child who you can hear very clearly over the noise of the pool as she proudly says ‘I can do that by myself, I don’t need any help doing that’ which always makes me laugh, my little miss independent 3 going on 13yr old. The next day was Wednesday, this was the day that I had been anticipating. I took Alethea to day care and then headed to the hospital to have a read of my notes. Ryan had asked me if I wanted him to go along with me, and I told him that if he wanted to come he was more than welcome, but if he had work to do that I would be fine on my own. He decided to let me go by myself, he had never read patients notes before and was happy if I read them and then let him know what they said. When I got there the medico legal person was waiting for me, she asked if I would be alright reading them by myself, she said she had had a look at them and it appeared to be a very traumatic event. I told her that I was a hospital pharmacist, that I was use to reading notes and that I would be fine on my own, so I was taken to a small room and began reading over all the notes. Truth be told I was unsure how I would be reading my notes, but as I started reading them I found that I was fine, I felt like I was in work mode reading someone else’s notes, I never felt emotional or upset, I was there for a purpose and I needed to keep my attention focused on my task. The notes set things straight in my head. To me it was obvious that the midwife had pulled out a separate piece of paper and was writing things down as she went, her timeline was rather thorough. Although I didn’t get a copy of the notes I do have a rather good memory and I remember reading an entry made by the midwife at 0130 stating that “The Dr is putting in an IV cannula and is preparing patient for theatre” so for me from the notes point of view the decision to do a C section had been made around 0130 because if the Dr was preparing me for theatre then surely he had decided to do a C section. There was no mention in the notes of exactly what Category C section I was but the midwife had ticked a couple of boxes stating (again this is from memory) that I was having early decelerations and that I had had single prolonged decelerations of up to 3 minutes (That was where Liam’s heart rate was dropping, like I mentioned in my first post). Again from memory the only delay that I remember reading about was that we waited in recovery for 10minutes before we were taken into theatre 7. I do remember reading the entry made by the NETS team (Neonatal emergency transfer service) and every entry written by them gave Liam a very poor prognosis and they did not expect him to survive. This made me feel better about the decision that Ryan and I had made when we said that we would cuddle Liam to sleep….as this decision had been played over and over in my mind and I was not sure whether we had made the “right” choice, but reading their entry (and they were the specialists in the room) they had basically said that no matter what was done that our little boy would never have made it, and I felt relieved in a way that we had not prolonged his pain and made him suffer just because we had wanted him so badly. After I had finished reading the notes the medico legal lady came into the room and asked if she could help me with anything. I told her that I was confused, that I couldn’t find what Category C section I had been and that if I was a category 1 C section the notes clearly showed that it had taken 74minutes to get Liam out. I asked her if she was able to find out what Category C section I was and if I was a Category 1 what was this hospitals policy on how quickly the baby should be delivered because for me 74minutes seemed like a long time. She informed me that she didn’t know what the policies were but she gave me the director of maternities phone number to discuss my questions with her. So I called and left a message on her answering machine and didn’t hear back from her until later that afternoon. I can’t remember the exact timeline, so I suggested to the directory of maternity that we get a copy of the notes and we can then go through the whole thing together and talk about any queries that you have. From my recollection, theatres were called as soon as we made the decision to do the caesar and were on the way. As the anaesthetist was already in the hospital, he decided to put in the epidural straight away to save some time. After this we wheeled you straight down to theatres and started the operation as soon as possible. I cant remember the exact timeline, but I can’t remember any obvious delays in the process. I’ll speak with the directory of maternity to get a copy of the notes and then maybe you could come in and we could go through them. You are right, even though a classification wasn’t formally given, it was a category 1 and that is why we got things going straight away. For a category 1 caesar we would like the time from decision to starting the operation to be less than 30 mins, so presuming the timeline you have is correct, it is a bit longer than I remember. Speak soon, and come in anytime you wish to go through things. I’ll let you know when I have a copy of the notes. Well from that short email, I knew that my baby had died because they had taken far too long to get him out. We had been told while we were in labour that Liam had the cord beside his head and that with each contraction the cord was being compressed reducing vital oxygen to him, my poor boy had died from lack of oxygen, he was asphyxiated in the womb. They had never give him the chance to live, they had taken nearly three times as long to get him out than they should have and he didn’t have that long in him, he was reason why Cat 1 C sections needed to be done in 30mins, he should be here, in my arms safe and sound, his life had been taken from him and I hated all of them for it. Please take the time to stay with me on this journey, I agree it is not a nice one, nor am I proud of the anger that I harboured, however it is part of my journey and although I am not proud of it, I am not ashamed, as I believe it helped me progress and has made me a better person for it, and I think that a lot of other mums and dads who have lost their babies have felt this anger as well. Unfortunately I won’t be available to post for 2 weeks, but after then I will continue our journey. Thanks to everyone for your support, your love and your patience with me. One very proud little girl doing the shopping for mummy! Each time I post a little more of our journey I do feel better, whether it is because our pain is shared or whether it helps me process it a little better I am not sure, but I know I am learning to love telling his story and letting people know about my little Liam, and I know that a weight has lifted from my shoulders since I started documenting our journey. Yes we will, and we do smile, we are 3 months on from where I am writing at the moment and we are able to smile! There will always be a dimness that surround us but life will be good again. One day, I hope that our story will help others, hopefully it teaches others compassion to people in our situation, hopefully it helps people understand that we want our babies acknowledged, hopefully in time it helps another couple in our situation see that eventually there is light at the end of the tunnel, that you can go through this and survive. Thank you for having the courage to share your journey so eloquently, It is a wonderful gift and tribute to Liam that he is celebrated and talked of so lovingly. The four of you have often been in my thoughts after discovering your blog. I am in awe of your courage and strength (even though you may not feel so strong right now) and I wish you lots of peace as you go through this together. Your pictures are beautiful too- thank you for sharing. Thanks for your beautiful words Stacey, it is lovely to know that people are out there reading our story and sending us wishes of peace and keeping us in their thoughts, I know that I am biased, but I think our pictures are beautiful too! Oh Amanda, I’m so very sorry your beautiful Liam is not here in your arms. Its so very sad this happened to you and I wish there was something I could do or say to help ease your pain. My first son was born by emergency c-section the day after his due date and my story is very similar to yours only I was very lucky to be blessed with a happy ending. You and your family are all so strong together, you will all remain in my thoughts and prayers, sending love your way! Thanks for keeping us in your thoughts and prayers Nicole and for your lovely words. You are truly very lucky to have your little boy with you and I am very glad your story ended with such a happy ending! Oh Naomi, I am sorry that you suffered birth trauma, but I am very happy for you that you have your son. A lot of people have written to us and in a way questioned our decision to let Liam go….trust me if there was any thought that Liam would have lived and had CP/dysphagia or a severe disability we would have pushed so hard for them to have kept trying to save him because he still would have had great quality of life in his own way…but Liam was no where near that, after 2 hours of resus his pH was 6.2 his O2 was 22% and his heart rate was still around 60-80 he would NEVER have made it let alone know who we were, we were told he would have been extremely lucky to make it to 1yr, if indeed he made it through the next few days. I suppose what I am trying to say and what I want people to know is that we didn’t let Liam go because he was going to be severely disabled, we let him go because he would have been in too much pain and had no quality of life, and it was the hardest, least selfish decision of our life. I am definitely not saying that you were saying this, but I just wanted everyone to know! Amanda, I am truely sorry for your loss. Your words are beautiful and your story stays with me daily. Liam will always be looking down on his amazing, strong Mummy. Thanks Danielle for your lovely words, I hope he looks down and knows how much we love him, need him and miss him. You do not need to apologise for your anger, people who have followed along this far with you will most likely be sharing your anger not judging you for it. From this brief description of things I’d say you have every right to be angry. I too am in a situation where the hospital mistakes have had an ongoing impact on my life and health, and means I am no longer able to have any more children. ( I have one perfect beautiful nearly 3 year old daughter). My anger at those involved in the mistake has dissipated over the last 2 years but it does not go away. You can not live each day consumed by that anger but you have very right to feel it today and for ever more. I do hope that you all continue to see the good in each day and the joy that you do still have in your life. Oh Elisha, I am so sorry that are no longer able to have any more children…it is of little comfort but I often say to Ryan, ‘at least we have 1 that is alive, lots of people can’t even have 1, and for that we should be extremely grateful’ yes it changes the way we treat Alethea, she is treated a lot more special than if we had more children…but that is not bad. I KNOW how lucky I am…some people can have many children and never really appreciate how lucky or how special they are, and that is truly sad, and I am sure your beautiful little girl is treated just as special as Alethea. Yes we see good and joy in nearly every day (yes there are still some horrible days) and I hope that you do to?! I think it is perfectly normal that you would be angry. I have felt so so sad for you guys and angry too and I am not even going through it. I know anger is unhealthy but sometimes it is needed for a short time you can never see things cleary with grief but for some reason you can with anger maybe its the adrenalin. Oh thanks Jo for your lovely comments. Liam has changed my perspective on life as well, I try to be a much more fun mum to Alethea, I never take her for granted and kiss and cuddle her as much as she will let me! Although I am not proud of my anger I think it was needed, I needed to be angry to be a voice for Liam, I needed to change the way things were done, and with the help of my anger I think I have. Its only natural that you would be angry.. how awful to think that Liam could well be here and have a normal, happy, long life, I would be incredibly angry too. I am so heartbroken for you.. I found it really difficult also when people ask how many children do you have… In fact I still do, all the time. In the beginning, I would feel guilty if I did not acknowledge Sam. I didnt care if it upset people, which it did, often. I thought, oh well, they ll get over it quicker than i would get over it if i didnt mention Sam… And its a part of life, people should just deal with it and you know, all the emotions that occur at this time. It was a really tricky thing for me to deal with. Sometimes I thought to myself, when people ask ‘how many children do you have’ that in fact, they arent asking me ‘how many dead children, and how many living children do you have’ . I guess in reality they dont want to know how many dead children I had. But I still didnt let that make a difference to what I decided to say in each situation, it was just a bit of a revelation to me at the time I first had that thought. I would never decide not to honour Sam because of what other people thought, he is way more important to me. Now, I kind of wait a bit longer before I tell people. I did have another child a few years after Sam passed, so i have two (living) children now. I just have a busier life I guess and when I feel that I will not have enough time to get into a big discussion with strangers i just say ‘a fifteen year old and a seven yr old’ and move on. Its more acceptable in my mind than saying ‘ just two’ or a number.. At this point, I think Sam would be okay with it, as am I. Occasionally I will tell people when I feel like it, even if i dont know them, and will likely never see them again; it just depends on my mood i guess at the time, but its never easy…. I still dread when people ask… and its wierd because you can kind of sense when the question is about to arise and often i will try to steer the conversation away! Or when they mention how there is such a big gap between my 15yr old and 7yr old.. I can relate so much to the feeling of being ‘the woman whos child/baby died’ I did feel like that for such a long time. Its an awful feeling. I remember it all too well, everywhere you went and saw people you knew, or who knew of you.. you were that one whos son died. Gradually that faded for me. I hope it does for you too sweetie. Alethea is so fortunate to have a mum like you. She is a gorgeous little darling. Thanks Laura for your lovely words, and you have given me food for thought regarding the question on how many children we have. I get a feeling that we are going to be the woman/man who’s baby died for quite some time yet. Sometimes when I think about it, it feels like it happened to someone else, I sit here and think who has a dead baby…surely not me. It was 4 months yesterday since Liam died…when I say 4 months it doesn’t feel like a long time but in truth it feels like forever, it feels a lifetime ago that I was pregnant and that I gave birth, I didn’t even feel like I was allowed to have a post pregnant body, I had no baby to show for it, so why should I have a tummy, I felt like I should have been totally healed before I left hospital, and when I felt the pain walking around the shopping centre I felt that it was undeserved pain, that I shouldn’t complain or mention it because I had no baby. I feel privileged that people have taken the time to read our journey and are willing to put themselves out there and feel uncomfortable reading such a horrible story to learn how to help people like us should they come across any, so thankyou Tamie, because every person that reads our journey is another person who knows how much our little boy was loved, wanted and deeply missed. I don’t think your story is a horrible story – yes there is a lot of pain but I’ve experienced it as a story of enormous love and strength. Thanks again Adriana, maybe one day I will see our story in the same light that you do! i have been following along your journey (i found your blog via Heartfelt) and just want to echo the above comments, please don’t apologise for your anger. I feel angry for you! Oh Anne thanks, your comment made me chuckle! Please remember that my side of the story is very biased as well! I hope in time I can show a balanced story from both sides, however being a mum I am sure that bias will always come into play! My anger (3 months down the track from where I am currently writing) has finally subsided…it dissipated 2 weeks ago but I know that if I was to sit here and really think about it, it would surface itself again, I just need to learn to put it aside now, because I am a better person without it! I realise that our situation makes many people very uncomfortable, but it does surprise me how many people have not even said to us ‘sorry for you loss’, only the other day we were with some friends, and I had seen the females but not the males since Liam’s death and not one of them were brave enough to say anything to us, it is like we are meant to pretend that he didn’t exist. Especially now 4 months down the track no one mentions him…not even family. Ryan and I talk about him and so does Alethea but everyone else just pretends it didn’t happen, and I realise that when people mention him I get upset, but people don’t realise that they haven’t made me upset, I am upset that my baby has died…just a horrible situation to be in! You are amazingly strong to find the answers that you need to move on. I will be a FTM any day now, and hope that I have even half your strength during labour and beyond. Enjoy being a FTM it is the best, most rewarding job in the world, enjoy every minute, I look at Alethea and can’t fathom where the time went! I too have shed many tears ready your story. I am so very sorry for your loss. I went through a very similar situation but we were so very blessed with a happy ending. I still have anger towards how I was treated. I was not told any details about my son’s birth (placental abruption while in labour and a code 1c section). I was offered no counselling, just sent home. It was only 5 months later when I went back to the hospital to visit a friend that I broke down in the foyer and needed to know, I organised a meeting to debrief the birth. I think it is so very important to have the power of knowledge. Everyday we are so very thankful for what happened on Ashton’s birth day. Thank you for sharing your story, it will help you and help others. Sending my love and best wishes to you and your family. What a scary time you had with Ashton’s birth, but what a fantastic finish it ended up with! I am very glad that Ashton was delivered safe and well. I find it hard to believe that medical professionals seem to be able to do whatever they want and not really justify it to anyone…’we did the best we could’ I really hate that saying because anyone can see that they don’t always do the best that they could and sometimes they just need to me ‘man’ enough and admit it. Amanda, reading about your journey at the same time as I am experienced mine, has really helped me understand and accept some of the things I am feeling. So many time it could have been me writing the things you wrote. My first born, Jaxon, was born sleeping almost 15 weeks ago. I was almost 40 weeks pregnant. I continue to feel anger and think I will forever at how my case was handled. How I’ve since found out the warning signs were there (he had the cord around his neck and they knew it!!!) but I wasn’t monitored more closely or induced. I understand your anger in thinking the loss of our beautiful children could have been prevented. I am sorry that you have lost your Jaxon, I think health professionals as a whole need to realise that saying exactly what happened and what failed to happen and saying sorry to patients doesn’t always lead to litigation and that it actually leads to closure for the patients and can take the fire out of their anger…I get angry that all these people who contributed to Liam’s death are able to go home, enjoy their wine, enjoy their families and not think twice about the train wreck they have left behind, and I am sure that you feel the same way too…how can people be so careless with babies lives?! You and me both…I would do ANYTHING to have him back safe in my arms, I would do anything to turn the clock back and do things again!